Ok, the title is slightly inaccurate, but Wet Weekend in Dewsbury doesn’t sound anywhere near as good. I only had one booking yesterday, due to the cancellation I mentioned in an earlier blog post. This was for the Schoolcroft Resident’s Comittee in Dewsbury. It was back to basics for a change as I had no power, so that meant no music and no microphone and we were outside in quite a small marquee, so the children and parents had to cram inside and it was a little more intimate than usual. Was a lot of fun and I actually ended up doing 10 minutes extra, trying out new material. Really enjoyed it. Today I’m off to Todwick for another Jubilee show, but this one’s been moved indoors due to rain so we’ll have to see how it goes. Last night was fun – Tame and I went to see Ken Loach’s ‘The Angel’s Share’ at the cinema. It was a great film and terrifically acted by a largely unknown cast. I’d recommend it. It gets a Kimmo rating of 4 out of 5 stars. We also got tickets to see Prometheus tonight in Imax 3D, so looking forward to that. After the movie we decided to go to the Flaming Dragon Oriental Buffet just outside the cinema. I used to love that place, but I’m not sure if it has gone downhill or all this fine dining Tamar and I have been doing since we got together has made me too much of a food snob to enjoy it. It had all the atmosphere of a school cafeteria, the food seemed really poor quality and it was by no means a cheap option, since we managed to drop close to £40 on a meal for two. Don’t think we’ll be going again. Tame didn’t even want to take a picture of her meal, so I knew it must be bad. 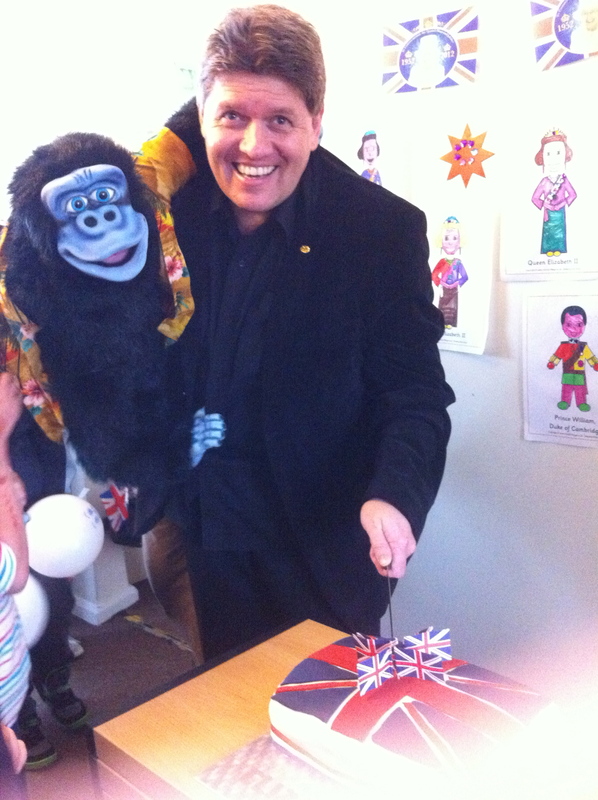 The Queen didn’t show, so Jambo and I got to cut the cake.